Visuals are an important part of most marketing strategies nowadays, especially on social media, blogs, and other types of online content. Because of the crucial role that they play, it is important that any images that you use for marketing are able to make an impact and effectively fulfill your goals. Resolution is important as it determines the size (and shape) of the image. Different social networks support different ranges of resolutions, and display it in different aspect ratios. As such you need to be aware of the resolution that you require from your marketing images right from the start, so that you can frame it with that resolution in mind. Every image that you use for marketing should have a singular message that is either implicit or explicit. Ideally you should try to keep the focus on that message, and all the elements in your image should steer viewers towards the point that you’re trying to put across. Because of that it is best to avoid overcomplicating the image, or including too many unnecessary elements that only serve to distract the viewer. While you shouldn’t plaster text all over your image, a few words can go a long way to help reinforce the message of the image, give it context, and even draw attention in some cases. If you do add text to your image however, it needs to complement the style and feel of the image while at the same time it should also stand out enough that it will be noticed and fulfill its goal. Needless to say if you want to add text to improve your visual marketing images it is important that you’re able to control their appearance fully. That is something that is easy with Movavi Photo Editor, and it will let you quickly add caption to photo and customize them too. Once you load a photo into Movavi Photo Editor you can immediately go to the ‘Text’ tab and click on the ‘Add Text’ button to add a text frame. After that you can use the ‘Text’ and ‘Background’ subtabs to adjust its appearance, and customize it so that it is more effective. 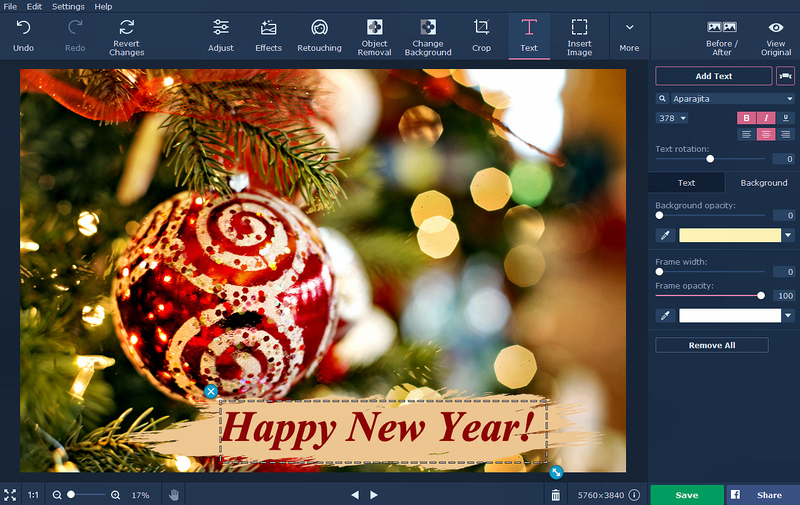 On top of adding text, Movavi Photo Editor will let you improve the quality, frame and composition, and other areas of your images as well. All said and done that should allow you to create far more effective images to use in your marketing campaigns – so long as you pay close attention to the areas listed above.